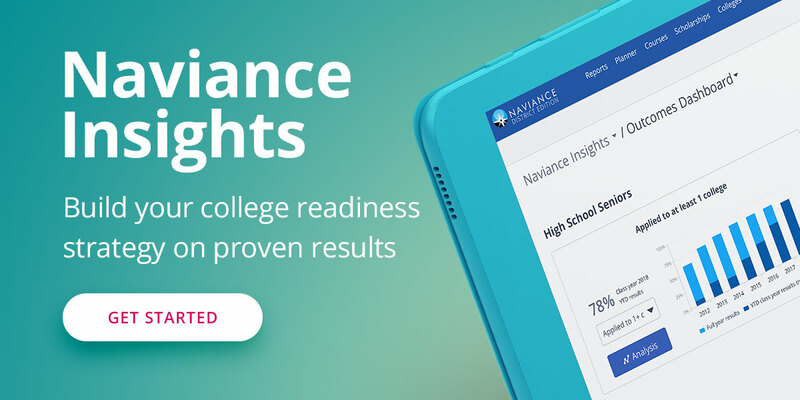 Noting the importance for students to have a purposeful pathway throughout middle and high school, OUSD implemented a scope and sequence for their middle school students that includes the Naviance Career Cluster Finder for students. Counselors work with students in the classroom to move through the assessment and determine which clusters best meet their interests. The more information that students have about who they are, where their strengths lie, and what their interests are, the more they can make informed decisions about courses, activities, and eventually career interests they might want to explore. When students explore their interests in a purposeful manner, they can feel better connected to careers that matter to them. Instead of basing career pathway choices on opinion, students can begin to see their strengths in their Cluster Finder outcomes. When students can see that a career pathway has many options, including levels of education, pay, and opportunity for growth, they can expand their horizons beyond just the most typical careers. The Orange Unified School District wants students to reach their end goal of a meaningful career. By helping students begin to define that pathway early, they can construct a plan to pave a path to their future career, including internships, career training, certificates, and postsecondary education. Orange Unified School District has attained an over 90% completion rate with career clusters, allowing middle school students to be fully prepared for course selection, individual learning plan fulfillment, and postsecondary planning. The district looks forward to continue working with students to define meaningful career pathways.